Image from the Zurich Central Library Graphics Collection. thing which has the property of acquiring thought is Soul." From today's vantage point, Heinrich Bullinger's life and work can be seen to make the point that modern democracy is not just an enlightenment experiment of recent vintage, but a tradition with roots in Scripture and Socratic speculative, yet practical, philosophy. This paper highlights the ancient origins of democracy and science to promote a history based, integral understanding of our present moment in time. A more adequate understanding of the present may lead to foresight and a realistic assessment of science-and- democracy's possibilities within the order of time. For Heinrich Bullinger, who managed to reconcile faith and reason, a failure to pursue the ameliorative prospects of science-and-democracy may be but a sign of an irrational, perhaps even unforgivable lack of courage and gratitude for philosophy's gifts. To seamlessly assimilate classical pagan notions into Christian Trinitarianism was still an intellectual challenge in the Cinquecento. But Heinrich Bullinger could draw liberally on passages from the fathers and doctors of the Church. Like Luther, though for quite different reasons, he may also have found support in the work of Gabriel Biel. (4) In Biel's theology, God's will and reason are said to be in equipoise since the Creator has limited his absolute power in concert with the counsel of reason in perpetuity. This self- limitation does not make divine judgments more accessible to human scrutiny. What it does is create a new, more reliable framework for stabilized expectations in which to conduct one's life in a reasonable way. The shrewd advocacy of intelligence in the Timaeus has, over time, shaped many sensibilities, specially of thinkers and scholars with Augustinian affinities to time- sensitive concepts of growth, development, and fruition. Its salutary effect is evident in humanists like Erasmus, and in the work of both of the Zurich reformers. (5) These men, even under duress, rely as much as possible on the irenic powers of intelligent persuasion to forestall confrontations with blind chance and brute necessity, chaos and fatalistic determinism. Their hope, though thwarted by collisions with fellow reformers of more radical stripe, was that through teaching by example the members of their growing flock the knowledge of intelligent persuasion's ethical powers, the precarious Odyssey of human conscious life, prefigured in the Book of Exodus, will overcome the stasis of corruption and stagnation. Liberated, people's lives will nimbly move ahead in rhythmic harmony with the accelerating beat of divine providence. 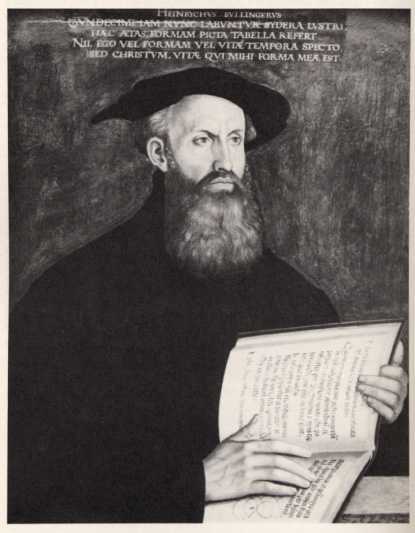 In his Brief Report of the One and Only Eternal Testament or Covenant of God (1534),(8) Heinrich Bullinger reconciles the Platonic account of reason's teleological role in the cosmos with Catholic orthodoxy following the humanist program, exemplified by Erasmus, to return to the primary sources to promote society's regeneration. This triple approach, incidentally, is consistent with Huldrych Zwingli's theological position. In the introduction to the Brief Report Bullinger says "Here you find what is the original Law of the solidly founded and pure Christian faith: What is in fact the first and oldest covenant and true service of God: the very goal of the whole scripture." When, at the dawn of time, the Creator gave his word to Abraham to be forever the sufficient source, the alpha and omega, of love and life, provided that we, as partners to the contract, attempt to keep its terms, an indissoluble partnership was formed. (9) This alliance, Bullinger insists, reaches across the immeasurable distance and power differential separating Creator from creature. It descends without hindrance from the father's free act of love, enabling us in patience to learn to respond in kind. Based on these premises, Bullinger's theology does not lend itself to criticism of the Supreme Power, nor its worldly representatives, and side-steps overt polemic against the many kinds of Gnosticism alive in Christendom. Human identity, according to Bullinger's hypothesis, is founded on the covenantal partnership. To learn to overcome the odds and come to honor the original agreement, with the requisite cooperation of grace, is to arrive at mature selfhood. The primary indispensable human bond is neither instituted by nature, nor by culture, but by the absolute, the numinous and transcendent. (10) The firm personal knowledge of this bond, no longer mediated by priest and ritual, steers the individual's daily conduct toward the ethical standards to which the human being as child of God aspires. Faith in the Trinitarian deity, for Bullinger, is not an irrational subjective mode of experience, but an indispensable rational ingredient of objective reality capable of setting in motion the regeneration and healing of human nature,(11) which finds itself in desperate need of repair. (Cf. OT Jeremiah 17:5-10; Psalm 25:10. Holy Qur'an 29:41). His understanding of the human situation vis-a-vis eternity, though stern, is more humane, lucid, rational, and hopeful than Calvin's teaching of the decretum horribile' and double predestination' in The Institutes of the Christian Religion (1536). The rest of the Bible amplifies the covenant by revealed passages as well as inspired prophetic ones. Both are mixed in with historical and legendary narrations, parables, fables, proverbs, figures, songs, poems, admonitions, warnings, sermons, letters. All function, inter alia, as commentaries on the Eternal Covenant, and, ex tempore, as modifiers that make the covenant's universality explicit, its terms non- onerous, and, most of all, increasingly accessible to human understanding. The words of the Bible have been written down by prophets, chroniclers, apostles and record-keepers to communicate their meaning, i.e., intent, to any reader who, while heeding the first commandment, pays undistracted, detached attention to the words themselves. The responsibility of the Reformation's hour in the Cinquecento was beyond the shadow of doubt to bring the word of God to the people in their own languages, and entrust it to their growing understanding in good faith. This pre-critical teleological view of time and learning Bullinger has in common with fellow reformers and other notable figures, e.g., Plato's Socrates, the Dante of the Divine Comedy, and the philosopher Hegel, at the time when he wrote the Phenomenology of the Spirit. (16) It forms the foundation of his cultural anthropology and philosophy of mind. The long range vision, which is this view's defining characteristic, permits him to circumnavigate many a crisis, write letters of counsel to people high and low (over twelve-thousand letters are still extant), and add a conciliatory tone to the politico-religious discussions raging at his time. Following the reformed fourfold set of principles, solus Christus, sola scriptura, sola fides, sola gratia', the new quadriga of interpreting scripture, he rendered the medieval way of reading scripture obsolete. And by highlighting the canon's design as an open-ended, inclusive charter for representative democracy, he created a new unity more in keeping with the new, people based sensibilities and, perhaps, with the Book's original intent. (Thomas Hobbes, father of modern national absolutism, transferred the Bible's federal structure to the purely secular political level, in the Leviathan, 1651). Bullinger shared the discovery of the Bible's federal structure with Zwingli, Leo Jud, and Oecolampadius, while being part of Zwingli's team of translators, who rendered the scriptures, from Hebrew and Greek, for the German speaking Swiss cantons, and adjacent regions. He brought it to public attention as a paedagogic principle in his study guide, Studiorum Ratio, published in 1528, when he was twenty-four. In this Study Guide he offers, apart from the new approach for reading scripture, a Liberal Arts curriculum along the time-honored pedantic lines of Martianus Capella's Marriage of Philology and Mercury. It takes a look behind the mask of quotes from Lucian's Dream of Scipio to detect the traces of the author's anti-traditional stance, which satirizes the customary eulogies of higher learning, and adds a dry note of consumer report realism. The Study Guide's democratic upside is that the classical poets, orators, historians and philosophers, and the biblical canon, are no longer reserved for people of feudal or ecclesiastical rank, but accessible to all who wish to prepare their wits for a productive life as free citizens of the reformed city states. The students' intellectual independence is encouraged, as is public debate. Small municipal institutions of higher learning, with teachers of international repute as magnets, are beginning to open their doors in Zurich to students from at home and abroad. Some of the best come from England and Scotland, courtesy of King Edward VI., and John Knox. How the word moves in time, is Bullinger's question. To say it moves dialectically' is insufficient, since what is meant by dialectic', whether as noun, or adjective, has not been established: Not by the reputedly rigorous art of science, nor by the more dubious art of rhetoric. Little wonder that what the dialectic is said to be invites the liveliest, occasionally deadliest, proliferation of misunderstandings. From Hellenic times onward, until today, the dialectic is frequently invoked by philosophers and propagandists as a deus ex machina' without a fact check how it functions in the scheme of time and things. Is the dialectic illustrated, at least in mythical fashion, by Pan, the One, disseminating himself into the Protean Many while re-absorbing and regenerating the vast progeny in non-interruptible repetition? Or, more philosophical in diction, does Nicholas of Cusa's notion of the coincidence of opposites disclose the dialectic's meaning? Or, last not least, does Proclus' neo-platonic scheme of the ineluctable sequence, popularized by Hegel, of thesis, antithesis, synthesis, do it justice? (19) Whatever the temptations of such speculations, and there are many, Bullinger steers clear of them. Bullinger writes a Summa of the Christian Religion (1556) in ten chapters. Serene in tone, and a model of clarity, this slender volume becomes a classic among modern textbooks for religious instruction throughout Europe. As an exercise in ecumenical diplomacy, as well as a commercial publishing venture, Bullinger's Summa turns into a remarkable success. Originally written in German, he translated the work with dispatch into Latin. And wherever in Europe a regional mother tongue was consolidated enough to permit a translation, Bullinger's Summa was published in the indigenous language, censorship notwithstanding, alongside Scripture. Each of Heinrich Bullinger's religious publications displays, as introduction or conclusion, a quote from the gospel according to St. Matthew, excerpted from the account of the transfiguration of Christ in chapter 17:1-9. The quote itself is the last sentence of verse five, God the Father speaking: "This is my beloved Son, in whom I am well pleased; hear ye him." (KJV) The Zurich Bible of 1532 says "This is my dear son, in whom I am reconciled; listen to him. "(22) The change from being pleased' to being reconciled' is quite deliberate. It announces the consolidation of a new, perhaps more profound, and surely more democratic understanding of how human beings are able to relate to God, to themselves, and their neighbors. In this new relationship, people are partners in a rational process where they may arrive to have a deeper trust in themselves, in God and each other. The democratic intimation manifest in this new translation, where the announcement of subjective pleasure is superseded by the declaration of objective reconciliation, confirms human liberty. (23) A sense of freedom lends individuals and communities new sources of strength and confidence. Both are needed in times of crisis as well as in peace, to face the future with an untroubled heart, and not be afraid of the unfamiliar. Heinrich Bullinger, half a millennium ago, gave his energies to communicate this new and liberating form of understanding. He did so, in word and in deed, and by the close fit of his work with the course of his long, fruitful life. 13. Sternly opposed to the semi-magical and mytho-historical modes of textual interpretation emanating from Medicean Florence, Bullinger calls on biblicists and humanists to follow in their interpretations the rules of the Socratic method. Dialectical reasoning and elenctic critique are the appropriate tools to ferret out, as well as validate, the most probable sense(s) of a passage. With this objective epistemological stance of scholarly reading, informed by the intimate knowledge of classical rhetoric, Heinrich Bullinger anticipates Spinoza's historico-critical approach to scripture in the Political Theological Treatise (1670).